–"Miguel, Don here. Say, remember that check that you made for the Volvo?" –"Yes, fifty-nine hundred dollars, why?" –"Well, they just withdrew that amount from my account for no reason"
–"I do recall having two or three times that in my account when I made the check"
–"Yes, it's weird. Two months later..."
–"I'll check with my bank and I will call you in a couple days"
The next day I went to the local Fells Fargo to investigate. After being told to call customer service in the office, and having customer service redirect me to the office, I sat down with my former banker and requested to see my old records. Much to my surprise, my friend's bank had only charged $59 for the car out of a perfectly legible $5,900 check with the amount spelled in big, capital letters, as shown in the computer records that my banker pulled out of her printer. I was disappointed –not only at my friend's bank, but at myself. The purchase of that car caught me in a moment of extreme stress, with thousands coming into my account –my old 1987 300TD wagon sale, my landlord's deposit, my savings from Spain...- and thousands coming out –equipment, personnel, travel expenses-. Movements in my account were quick, confusing and banking in three institutions did not help –however, this would not excuse my lack of financial sensibility. I never learned accounting, or finance, or any kind of money management. I never earned or spent so much money in my life. It all came at a bad time, but fortunately, early: it was now time to assume my errors and be responsible. A quick call to my friend solved things in good terms, and he agreed to take the car back. After shooting an episode of Open Roads with that Volvo, I did not have any use for it rather than a long, expensive restoration ahead of me. I had already close to six to seven hundred making it mechanically reliable, in fact, so reliable as to drive across half of the USA again. And so I did, instead of transporting the car. 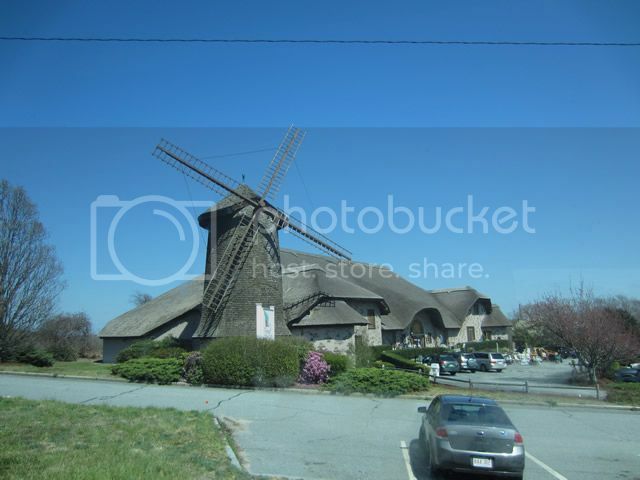 Some beautiful Dutch-style mill in Cape Cod, MA. The drive took two long days, at 850 miles each. Eight-hundred and fifty miles of barns, straight roads, interstate and roadside trucker stops; colorful fireworks warehouses and industrial buildings painted in bright colors, promising more carnal pleasures. Past the Ohio border drivers got progressively more impolite, especially in New York and Massachusetts. 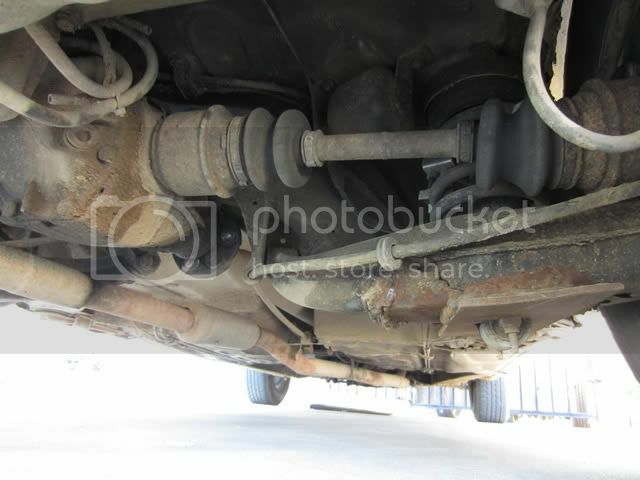 To this day I still do not understand how people expect a car made forty years ago to perform, brake and handle like their late-model, high-tech family trucksters, minivans and econoboxes. On the bright side, I got the thumbs up from two drivers, one of them being an overly enthusiastic youngster shaking spasmodically in a tricked-out Mitsubishi Lancer with a crushed fender. Still took it as a compliment. Finally, the next morning, I woke up in the limited space of my car's cabin, alone in the expansive lot of the local Stop'n'Shop in Cape Cod. I put some gas in the tank, had some breakfast and visited my friend, who, with understanding eyes not reflecting disappointment, still could not believe that the car he had sold to me a few months ago, the car that had been sitting for ten years in a customer's garage, the car that he had given me strong cautions to trailer away upon its purchase, had made it to his driveway, running better and looking cleaner than it had in the last decade. 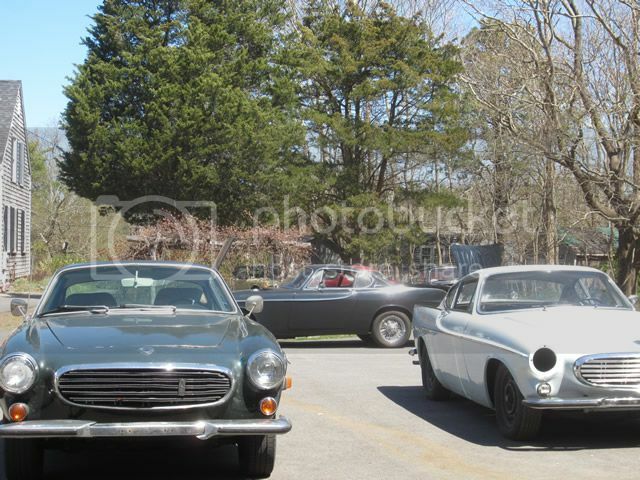 Don's driveway... one day he let two Volvos together overnight and they MULTIPLIED. Driving across the USA is no cheap endeavor, even if you pack your own food and sleep in the car, like I did. It reaches close to $250 in fuel alone, so you must try to multitask to make the effort well-worthed and get the best out of your money, especially if finances are tight. In this trip I decided to pick up a car halfway to Kansas, and drive it back. This car, my friends, shall become a legend. On the way back, I stopped in Boston for a couple hours, which did not allow me to do much other than charge my phone in a charitable clerk's computer, and grab a bite. What followed from Boston to Columbus, was sheer hell for my poor, hurt tailbone. I have slept in buses, in trains and planes, but Greyhounds are just a... just a... darn, "nightmare" would not even describe it because it implies a minimal degree of sleep. It is plain purgatory, where souls cannot be left awake or asleep, in the warmth of a crowd, yet the smell of a gymnasium. In Boston the passengers looked acculturate and tidy, reading their books. As soon as I transferred in Cleveland I had to sit next to a large man holding an equally large pepperoni pizza: even if I didn't have much space, I had the comfort of the smell of baked dough. Oh, the places you'll go! It was also in Ohio where I met two interesting homeless gentlemen whom I gave the rest of my edible luggage: a large bag of Frito's –one of my favorite snacks– and a can on honey peanuts that I got for free with an offer from CVS. I talked with one of them, who told me about the hostel he was living at, and how scarce detergent was there... which reminded that at that point I probably smelled worse than him after four days on the road, two of them in a Greyhound. Finally, the Greyhound stopped in a large, half-abandoned gas station in Chillicothe, OH. I waited for the seller to appear. "If you see someone driving a truck that looks like sh*t with a smokestack in the back, that's me", he said. Something told me I was setting myself up for another interesting situation. The gas station was owned by a very polite Indian gentleman, who not only let me stay out of the cold, but pointed me at a nook that led to a former dining area used as storage, the perfect place to sit. Five minutes later, I effectively identify a heap of rust –a Ford F150 at one time- with a huge chrome smokestack in the edge of the bed. Yep, that must be him, Brandon. Brandon is a 27-year old man with a dense beard and a heavy Midwestern accent. We shared some stories about friends who enjoy hoarding things, and how his house was a few miles from an nuclear power plant. Almost half an hour later, we arrived to his property: "I do not like people, but I like talking to you! ", he said. I sighed, as I was imagining the moment in which he would have drawn a gun, forced me out of the truck and ended my blogging right there, in the middle of the forest. Close to half a mile of rocky driveway later, there it was: a 1984 Mercedes 300TD. I got out of the truck, excited to see a brother to my loyal Newport. 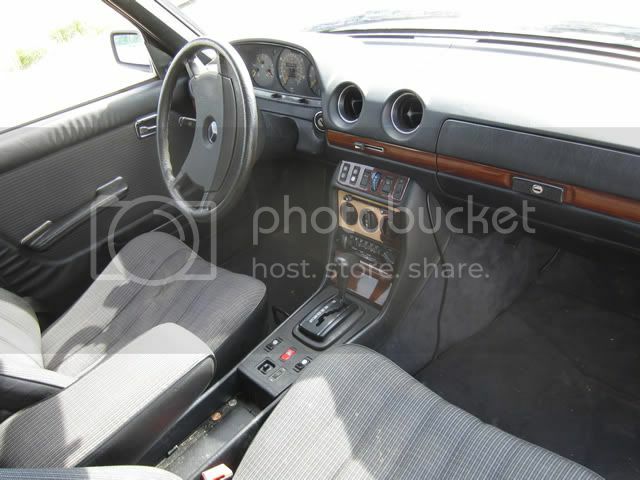 My enthusiasm turned into awe as soon as I found out it was a rare European turbocharged model, with the 3rd row jump-seat. Oh, Lordie, I wanted it so bad! He threw the key at me, which I speedily put in the ignition and turned, to hear a perfectly synchronized five-piece ensemble. I now had to negotiate the right price. This is the wagon, after some superficial cleaning and vacuuming. I had planned to buy the car to restore, so I could take it entirely apart and learn every nut and bolt. Unfortunately, the car had rust in every single detachable panel, but a solid frame, low miles and a drive-train tat could easily offset the purchase price. I offered one thousand dollars, to which he replied with $1,200... and so we struck a deal. We went up to his mother's home –a public notary– and did all the paperwork right there, still talking about Volkswagen rabbits and other diesel wonders, at the tune of pizza. An hour later, we both refueled at a local diesel stop and waved each other goodbye. Easily one of the most pleasant car purchases I have ever made! Low-cost ingenuity, or all-out redneck engineering? You decide. I drove the wagon across the Ohio border, and slept in a truck stop in Indiana. The following morning I resolved to make it to Kansas before midnight. I drove past barns, farms and silos for many hundreds of miles, admiring the build quality of this Mercedes, still running like new after almost thirty years of loyal service. Much to my surprise, the A/C and cruise control still worked. I tuned some country music on the radio and let my mind drift down this long cruise. At some moment in Illinois, everything became clear: the name of the wagon should be Orwell, given that it was a 1984 model year, but most importantly: this was the expedition vehicle I had been waiting for! It also has many good parts to sell and still keep it plain, simple and functional! For many months now, I have been daydreaming about the Pan-American trip that I will undertake in the next two years, from Anchorage to Argentina, and the best vehicle to do it with. I thought of a Toyota diesel pickup, but it is a vehicle without character and it has been the choice of many travelers before. Maybe a Mercedes diesel; after all I would not desperately need to have four-wheel drive. Newport, my other 300TD, fared very well in the snow with the right tires and driving style. 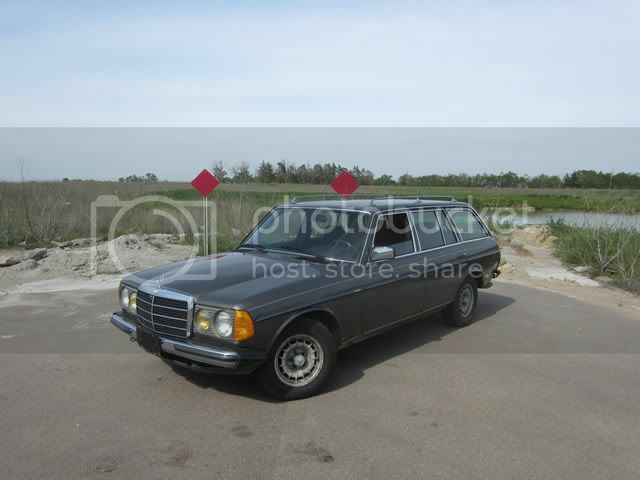 I deem the W123 Mercedes-Benz wagon as one of the best, if not the best, vehicles ever made in terms of utilitarian, reliable functionality and durable construction. Newport is too nice to drive down and beat to death in the Americas, so Orwell, this adorable beater, soon became my choice for a vehicle that would stand the hardships of the road as well as be shabby enough not to be noticed. My dear friends: I have found the car, now it is a matter of time. For now, I will remove some parts and sell them to compensate for the future maintenance/upgrades it desperately needs. Big plans await on this one! Orwell is a super sharp car, Miguel. Kudos. And, though the circumstances surrounding the return of the Volvo are less than ideal, I think it's very cool how the original owner accepted it back and was at least appreciative of the work you'd done to it over time.